The U.S. Army Corps of Engineers' Walla Walla District this week announced it has completed an environmental assessment for its Inland Avian Predation Management Plan - a strategy that contains management actions designed to reduce predatory birds' impacts on salmon and steelhead species that are listed under the Endangered Species Act. Corps district leadership signed a "Finding of No Significant Impact" on Jan. 23. The decision completes the Corps' environmental review of the management plan under the National Environmental Policy Act. The Corps has led a cooperative effort with the Bureau of Reclamation to develop the IAPMP for managing birds that prey on ESA-listed fish species in the Columbia and Snake rivers. The Corps and Bureau manage hydro projects in the Federal Columbia River Power System, which includes four lower Snake River dams and McNary Dam on the Columbia River that are within the Walla Walla District. The avian predation management plan aims to comply with NOAA Fisheries FCRPS biological opinion and incorporates the necessary analysis and documentation, the Corps says. The IAPMP describes land-management actions to be taken on federal properties located at Goose Island (Potholes Reservoir, Grant County, Wash., managed by the Bureau) and Crescent Island (McNary Reservoir on the Columbia River, Walla Walla County, Wash., managed by the Corps) to reduce avian predation on juvenile salmon and steelhead. Previous research has determined that the greatest benefit would be achieved by managing Caspian tern colonies at these islands because of the birds' demonstrated high rates of predation on ESA-listed fish species. Reclamation has adopted the Corps' EA and signed their own FONSI for implementation of this plan at the Goose Island location. Provisions for monitoring and adaptive management are included to assess outcomes of the implemented actions. The effectiveness of tern-dissuasion actions at Goose and Crescent islands may be enhanced by adaptive management actions to limit terns from forming new colonies and/or expanding existing colonies within the Columbia River basin. The plan also includes provisions for developing out-of-basin nesting sites to attract the terns to areas where they will not feed on Columbia River ESA-listed fish species. That strategy mirrors one being implemented by the Corps as a means of dispersing Caspian terns that nest each spring and summer in the lower Columbia estuary at East Sand Island. That program likewise is intended to reduce predation on listed salmon and steelhead. A benefits analysis showed nesting colonies of Caspian terns at Goose and Crescent islands were major contributors to ESA-listed salmonid predation in the inland Columbia River basin. In 2012, these colonies had over 400 pairs of nesting terns each, according to ongoing research, and are the two largest CATE colonies in the inland region. 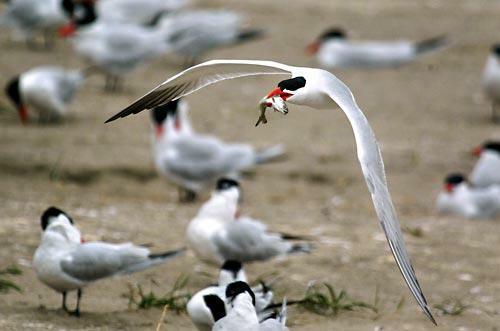 Based on the recovery of PIT tags that has been implanted in fish for research purposes, it is estimated that Goose Island Caspian terns have had up to a 14.6 percent predation rate on Upper Columbia River steelhead and Crescent Island terns up to a 2.7 percent predation rate on Snake River steelhead, the Corps' EA says. In comparison to reducing tern nesting at Goose Island and Crescent Island, the incremental benefits to ESA-listed salmonids are expected to be substantially lower through reductions in predation by other avian predators within the inland Columbia River Basin including terns at Blalock Islands, double-crested cormorants at Foundation Island, and gulls nesting on Miller Rocks. The EA's preferred alternative outlines activities that include habitat modification to create unfavorable nesting conditions and hazing of terns to dissuade nesting. A U.S. Fish and Wildlife depredation permit could be sought for the removal of up to 200 tern eggs (from Goose, Crescent, and the at-risk islands combined) per year, though it is possible that no egg collection would be necessary with daily hazing, the EA says. "Egg removal would only be used after all other options have been exhausted. As eggs may potentially be laid throughout the nesting season, egg take could occur throughout the nesting season of any given year of the project." It is anticipated that Year 1 implementation, such as habitat modification in late summer after the nesting season is completed, would occur as early as 2014. "The year these actions are actually initiated, however, would depend on a variety of factors including items such as the availability of funding, permits, and monitoring and evaluation results (particularly with respect to adaptive management actions)," the EA says.